Happy Summer y'all! My favourite season is FINALLY here and I am so excited. The past two Summers were absolutely crazy, with 2015 being the year I was MOH in my brother's wedding and wedding activities pretty much took up every single weekend and then last Summer I was still working at my part time job and was working weekends and long days throughout the week so I really didn't get to enjoy my Summer as much as I would have liked. This year my Summer is fairly open. I have a trip to Vegas for my 30th birthday in July, a trip to the Twin Cities at the beginning of July, and then the rest of my Summer is open to enjoy and be able to be a little more spontaneous. I do have two weddings to attend but they're at the very beginning of Summer and closer to the end of Summer so they really don't affect the months of July and August, which is what I think of when I think of Summer. 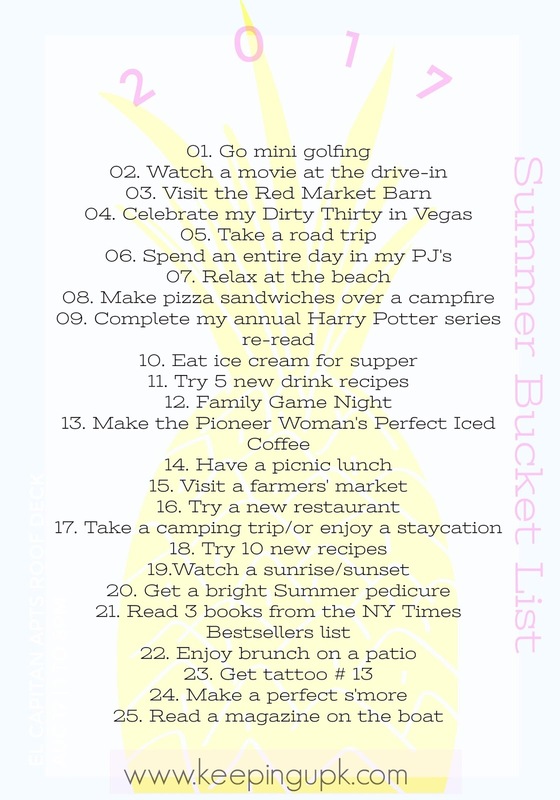 The last four years I have made Summer Bucket Lists for myself (2013,2014,2015,2016) and then pretty much forgotten all about them and hardly crossed anything off of them (whoooops). But this year will be different! I've taken things off my lists from the past few Summers that never got accomplished that I'd still like to do and hopefully this Summer will be the one to finally get them off the list. Then next Summer can be full of brand new ideas and adventures! I managed to get a few things crossed off of my Spring Bucket List, just not as many as I would have liked. Obviously I should be striving to do everything since they're all things I picked for myself but time just got away from me. 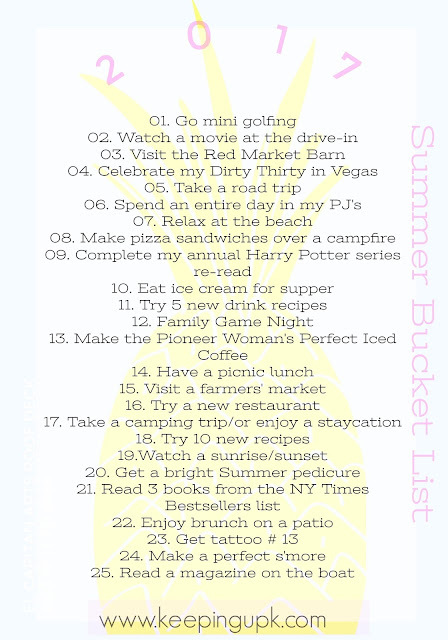 I thought about adding the things that didn't get crossed off to my Summer Bucket List but decided that I'll just finish up a few of them and update my Spring Bucket List with some items completed in the Summer months. Looks like the plans for a fun summer!